Wouldn’t pop stars be just a little bit more interesting if they had to battle monsters while simultaneously singing some tunes? It’s an odd question to ask, but it’s one that the folks over at Galapagos RPG clearly must have been thinking about a lot before making Omega Quintet. In the universe of Omega, demon-like monsters called Blare plague Earth, killing people and causing destruction. As it turns out, the only ones who can stop these monsters are young women who wear skimpy outfits and sing as they bash the Blare into oblivion. Called Verse Maidens, these girls partially rely on public support to take full advantage of their abilities, and thus their battles are turned into a sort of concert/television show that their (mostly male) fan base watches intensely. The game begins with the widely popular Miss Momoka retiring as a Verse Maiden, causing five new Verse Maidens to be brought in. Along with the new Verse Maidens, a male manager is brought in. 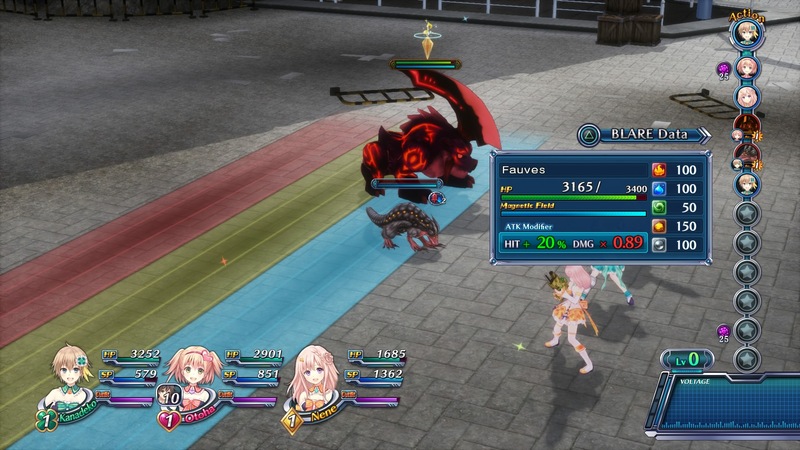 The player is able to control the group of five Maidens in combat, and while exploring, they must play as Takt while moving around the Verse Maiden’s headquarters or talking to characters. Of course, considering Takt is the only male to ever hang out in the Verse Maiden’s headquarters, Omega Quintet feels the need to have him see a lot of girls in their underwear, just because they are too darn innocent to know that hanging out in one’s underwear could be considered a sort of sexual thing. While I summed that beginning up fairly quickly, Omega Quintet actually draws it out for a long, long time. That’s not a good thing. Originally, players only can use one Verse Maiden in battle, and after a few hours, two more join up. After another few more hours, another two join up, finally allowing players to actually a have a full party in combat. While Omega does this to let the player learn all of the combat and exploration mechanics little by little, it really shouldn’t take more than five hours to let players become used to the game. It doesn’t help that Omega is also packed full of a ridiculous amount of dialogue. Most of the dialogue is just fluff — just nonsense that serves no real purpose other than to elongate the game. Every few minutes, whether the player has just completed a mission or is just starting a mission or is just walking around, huge cut-scenes will just appear out of nowhere. I found that usually the first or second sentence of the, say, 40-sentence cut-scene has actual useful information. After that those first few sentences, I just kind of skipped through the dialogue. I replayed some areas just to see if this method actually works or if I was missing out on any interesting or useful information. It turns out this technique works just perfectly. Luckily, the game isn’t entirely filled with useless dialogue. In between all the fluff are numerous areas to explore, a large amount of quests to complete, and an engaging combat system. Of course, most of the quests are fetch quests — kill five monsters and collect material that they drop — but that is to be expected. The amount of areas to explore is pretty impressive, as each area contains fairly unique Blare and unique environments. Exploring happens in real-time, but after an enemy is approached, the combat phase begins, and the game enters the typical JRPG turn-based combat setup. The battles themselves are actually pretty fun. Each of the five Verse Maidens have their own special abilities and modes of attack. Like many other JRPGs, elemental damage plays a pretty big role, as enemy types are either weak or strong against certain elemental types. This ensures a certain level of strategy when managing which Verse Maiden will use which skill against while enemy. While boss battles can end up feeling a little drawn out, simply due to how many darn hits it takes to actually bring them down, on the whole combat is engaging and quick. Takt is also drawn into the battles, and can be linked with one Verse Maiden at a time. Whenever that Maiden is attacked, players can press a button quickly to him block some of the damage the Maiden is set to take. When the linked Verse Maiden attacks, players can press a button and have Takt leap out and deal some extra damage. It’s a neat little feature that ensure that players can’t just mindless click attack, but instead they actually have to pay attention to what is happening to hit those buttons at the right time. While not in combat and not exploring, players can spend time in the Verse Maidens’ headquarters. Here, the Verse Maiden’s outfits can be repaired (they fall apart as they take damage, leaving them essentially naked after a while), weapons can be crafted, and various health items can also be created. Unfortunately, the weapon crafting system isn’t really as strong as it should be. Only a very small handful of weapons can be created, and these can also just be found in the wild. The weapons can somewhat be leveled up and enhanced, but this is fairly limited and the crafting system ends up feeling more like an afterthought than anything else. It should be noted that players can also create music videos of the Verse Maidens. This doesn’t really have much of an impact on the core gameplay, but it is kind of cool to pick the song, the dance moves, and the layout of the music video. Someone could spend quite a while creating a video if that person so chose, but, again, it really doesn’t serve much of a purpose. It’s kind of hard to give sum up Omega Quintet. It does some core things right, like the combat and the numerous places to explore, but it does a lot of little things wrong, such as the huge amount of fluff and the useless crafting system. I think a sequel would have a lot of potential, but as it stands Omega Quintet might not be worth your money, unless you want to skip by most of the story and dialogue and just focus on the game’s solid combat system.